Mr Flibble, ever concerned, wanted Ross to prove his credentials for THE JOB - after all, this man would be involved with his episode coming out on DVD next year! I am Senior Producer for BBC Worldwide's DVD and Video Department. After joining Radio One in 1984 as their runner, I moved over to BBC Enterprises, as it was then, as a trainee Technical Operator, then got a job as researcher for BBC Video gradually moving up to be Assistant Producer, Producer, and at the start of 2003 was promoted to Senior Producer. Basically I run the creative side of our DVD production, assigning titles to the assistant producers, working on my own titles, liaising with our marketing and commissioning areas as well as our International division. The arrival of DVD must have changed things a great deal at Worldwide - how steep was the learning curve for the new format? I saw the potential of DVD back in 1998 and began looking into it then. None of us really had any idea of the impact the format would have in such a short time. I remember drawing a DVD production process map in marker pen on a huge white board and as we progressed from left to right we actually ran out of space on the board as we discovered there was so much to be considered! I've still got a picture of that board somewhere, as we were so gobsmacked by its complexity. To be honest I'm still learning things even today, but the initial curve was massive and we relied heavily on advice from the third-party studios we were looking at to carry out the work for us. 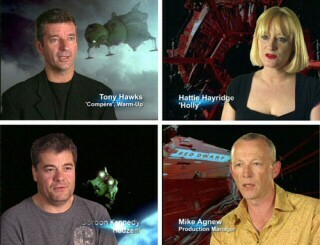 How long did the RED DWARF releases wait before the project started? 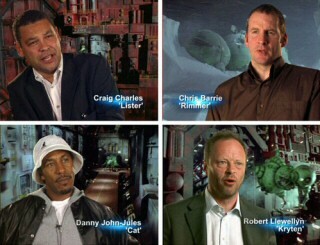 Red Dwarf was the very, very first title we ever considered putting onto DVD way back at the start of 1999. 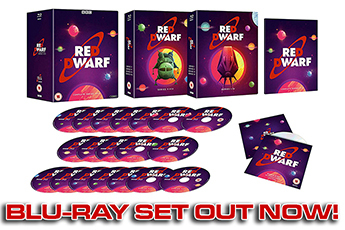 We were so excited about what DVD could do and felt that Dwarf was the perfect vehicle to launch our range. I remember going round to Ed Bye's house to discuss the release with him, and we phoned both Rob and Doug up that very night. After 'sleeping on it' I think the decision was made that Dwarf was too important a title to be the 'guinea pig' DVD for the BBC, so the project was put on-ice until we felt confident that we could all contribute the very best to these shows - and I think we've now done that. 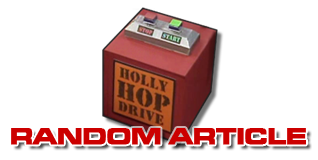 For the Red Dwarf DVDs we meet a year before the assigned release date of each series to discuss what we are going to do, decide on music we want to use and put that into clearance straight away, as it takes a very, very, very long time to clear music tracks for DVD and Video. I call the tapes up and have them assessed for 'clean up' to make them DVD ready, removing grain, noise, dirt etc., and turning old analogue tape into digital tape. Then we start working [with GNP] on picking chapter points, sourcing missing scenes, smeg ups, filming interviews, storyboarding menu designs and recording commentaries. The commentaries are great fun, if a little tricky to organise. Trying to get five cast members in one place at one time is no easy task. Chris was doing Tomb Raider 2, Danny had TV and music projects on the go, Robert was about to start a new series of Scrapheap and Craig... well Craig never stops working does he? Still, once they're all in the studio, and Danny's had his cooked breakfast, it's enormous fun to run the session - and they pay me to do this as well! We like to let the commentaries run as freely as possible, writing copious notes on 'tricky/ scandalous' comments and making sure they don't make the final mix down. The guys - and gal - all work well together. Craig's power of recall is phenomenal, and we do supply notes and prompts to help if things start to slow down. What are the biggest headaches on a DVD as complex as Dwarf? 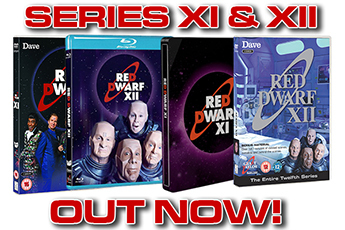 With so many people involved in creating the Dwarf DVDs, it is sometimes difficult to be able to stick to your original production timetable. Doug may not be available to approve a menu, a tape might be missing, a piece of music hasn't been cleared, subtitles need to be commissioned... it goes on and on. And then, when we've got all the elements together, we have to get it all certificated by the BBFC before we encode the video and audio. You might think a year is a great long lead-time, but you'd be surprised how quickly the times goes. At one point around May this year I had 18 DVD titles on the go at the same time, so my time was severely stretched to say the least. Mr Flibble said he'd offered to lend a helping wing, but Andrew had locked him in a drawer. How did the DVDs come to be using Deluxe Digital who author the discs and build the fantastic menus? There are many fantastic authoring houses out there, but we needed to consolidate our work in one place and Deluxe had done us proud in the past with designs for Walking With Dinosaurs and our Dr Who titles - so we felt the quality of work, and their sci-fi experience, would lend itself to Dwarf. Phil Valentine, their Inferno Operator, actually worked on some of the effects for Lost In Space, plus he's got a fantastic sense of humour and is so easy to work with. Millene, who models all the environments on MAYA, is so good and so dedicated it's impossible to fault her. 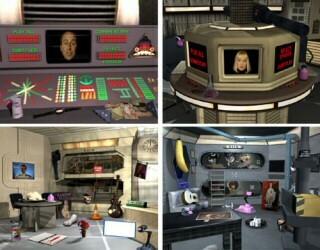 I remember when Doug first popped in to see some of the [skutter] renders for Series I, he simply looked at Millene and said 'Where were you in 1988?' Praise indeed! Jonathan, the line producer for Deluxe, is invaluable to the whole process. He marshals all the resources for me, takes all the stick from his design team when we ask for changes and generally makes my life easier. What are your FAVOURITE aspects of the two series currently out, and the two that are about to be released? I'm a great fan of commentaries on DVD, and the Dwarf ones are superb. I also think that the menus, though time consuming to do, are exceptional - especially for a TV show. On all four series I also really like the featurettes, Drunk, Alternate Personalities, Food and Lurve. They're fun. Without saying too much, what kind of things do GNP and BBCW have on the cards for the next pair of series? How do you top what we've done up to now? Well we're going to try. There's plenty more that can be told in interviews and new documentaries, possible branching to deleted scenes - rather than having them as separate items we could weave them into the actual programmes... we're always thinking ahead, so watch this space. Mr Flibble wiped the sweat from Andrew's brow at the thought. 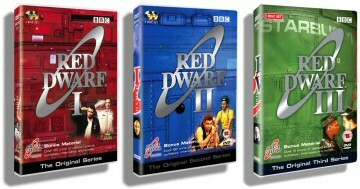 Obviously, in that respect Dwarf has been very lucky - a lot of BBC releases have been near-vanilla releases. What's the decision-making process behind that? Bonus content is often dictated by sales predictions and availability. I'm a firm believer in not just throwing scrappy little bits and bobs onto a disc just because you can... an extra has to be relevant and entertaining to be worthwhile. Availability can mean there are no extras around, or it can mean that the actors are sadly no longer with us. Dad's Army is a prime example of this, but it's such a classic show the episodes are strong enough to stand alone. I've worked right across the board on BBC DVDs, from Robbie the Reindeer to Walking With Dinosaurs and everything in between - from Happiness and Bottom to Edge Of Darkness and The League Of Gentlemen. And, of course, The Office. Seeing Ricky Gervais in the middle of a meeting do 'that dance' to illustrate a point was a strange sight indeed. He's so laid-back, and yet so very, very focussed. His brief to me about the Office menus was to make them 'bland but brilliant', and I think we achieved that... well Ricky and Stephen [Merchant] were extremely happy with the results. The guys from The League Of Gentlemen are very hands-on in making DVDs. They've fully embraced the potential of DVD and know what they want, and, indeed, why they want it. They're nice people too, which makes all the difference. Again, they slip into characters at meetings, which can be quite unnerving - one minute you're speaking to Steve Pemberton and then you're having that conversation with Pauline... scary. Yes, The Office was one of those remarkable things - right time, right place, and a work of genius to boot. I was anxious at first about the initial run of discs to go in-store, but that soon changed when we were reprinting within a week. A show like The Office comes along once in a blue moon. It went from cult status to global phenomenon almost in the blink of an eye, it just hit that right chord with the public and I can't wait to see the Christmas specials. I know a little bit about the content but sadly I've promised not to say anything yet! How do you see the DVD format and market developing over the next few years? The format and market can only expand. Home entertainment has never been more prominent with consoles and PCs having the ability to play DVDs, home cinema systems coming down in price, and broadcasters now shooting in widescreen - it all bodes well for the future. I still see a good market for our back catalogue, there's something so collectable about DVD. Mr Flibble enjoyed talking to Ross, and now that it's over... Mr Flibble is very cross.